Learn about biophilia and botanical art, then learn to craft your own mounted creation! Plants, pizza and Prossecco…we’re popping up at Meribo! Join us to connect with plants, create something beautiful while wining and dining! It’s going to be a lovely afternoon. We’re popping up on the streetcar line at Canal Place for a Saturday of what else….PLANTS! Come plant a succulent pumpkin, shop our botanical art and see our newest botanical creation…a massive moss wall that lives in the heart the Canal Place. Ideal for a selfie or photo with friends, this wall is meant to take you to a moment of serenity and provide connection with nature in a luxe space . Join us for an evening of planting, hammering, crafting and learning. Succulents, mini pumpkins and mosses make this cute fall centerpiece. Create your own and learn how to replant your baby succulents! Join us for a morning of exploring, foraging and creating! Join us for an evening of planting cacti and learning how to properly grow these prickly charmers both indoors and outdoors! Don't miss September's Art Walk! Join us at our VW pop-up plant van on Julia Street at Auction House Market for botanical art, specimen plants and much more! I M M E R S E yourself for a Sunday of mindful planting. This botanical meditation class focuses on how to incorporate small elements of Mother Nature into your own environment. Shop our botanical art at this summer market! In celebration of Hawaii Day, join us at the Auction House Market event space for Hawaiian fun, food and tropical botanicals! We will have Hawaiian / tropical houseplants, botanical artwork, wearable plants, and a succulent DIY station! 10% of botanical sale proceeds will be donated to The New Orleans Family Justice Center . The New Orleans Family Justice Center invites you to HAWAII DAY! A day full of art, culture & music featuring pineapple painting contest, hula experience, Hawaiian culinary beverage tasting, Hula Twist cocktail, & special guest - Luna Botanicals! ***This is a ticketed event to benefit the New Orleans Family Justice Center. Luna Botanicals plants are not included in the ticket price. Master the Japanese art and craft of kokedama by learning to create your own moss ball string garden. You’ll get your hands dirty with our special Louisiana bonsai soil mix while making something…stunning! The Influencer Lounge is a destination where influencers and brands connect, collaborate, and vibe together with great music by guest DJs, craft cocktails, and boutique food vendors. Mount your own orchids to reclaimed wood at Auction House Market. Join us at Lionheart Prints for an evening of planting, learning, laughter and socializing amongst expertly designed furniture, plant accessories, structural succulents, lush preserved moss and sparkly crystals. In celebration of Earth Day, I M M E R S E yourself in an indoor urban jungle for a day mindful planting with Luna Botanicals and The Space at Raw Republic. We'll bring the succulent spread, and Broad Street will have a variety of ciders available for purchase, including their much anticipated creation, "The Green Fairy," an absinthe botanical cider. Join us to purchase one of a kind botanical art and curated plants! Shop this outdoor market of local artists in the front and year yard space of Home Malone! Earth Day Celebration! Join us for a botanical art plant sale, succulent meditation and kokedama workshop! Get your hands dirty in one of our most popular workshops at one of our favorite inspirational spots around town, the Space at Raw Republic! We teach you the proper techniques for plant selection, kokedama construction, how to care for the kokedama, and how to style these living works of art in indoor or outdoor spaces. You’ll get your hands dirty with our custom-mixed Louisiana twist on bonsai soil, and leave with your newly constructed botanical art and the knowledge of how to nurture it for years to come. *Workshop admission includes hands-on assembly instruction, care directions, all plants, materials and use of tools. Shortly after purchase, you'll receive a reservation confirmation email, which serves as your admission ticket. I M M E R S E yourself in an indoor urban jungle for an evening of mindful planting. This class focuses on how to incorporate small elements of mother nature into your own environment. Join us for a Saturday of planting, hammering, crafting and learning. Connect with nature, relax your mind and leave with a new succulent to new nurture. Planting, hammering, crafting and learning - you'll leave this stimulating workshop with a newly mounted fern friend in hand! 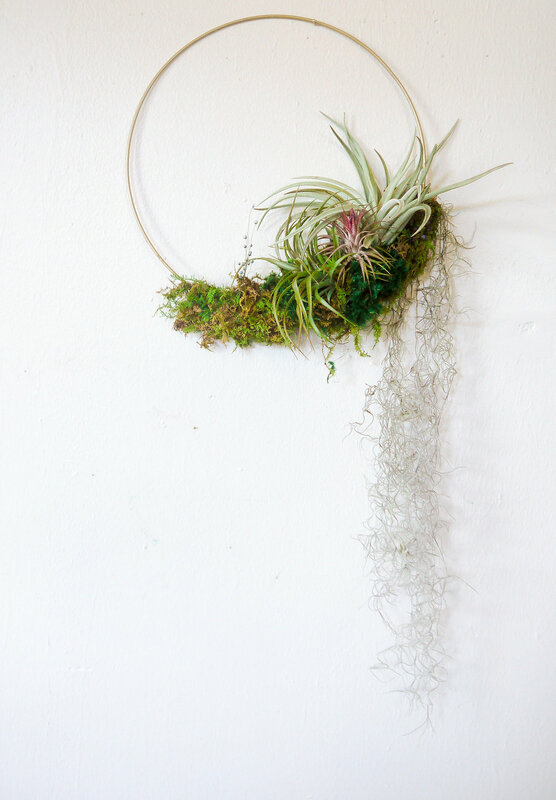 Learn how to craft a modern Tillandsia wreath. 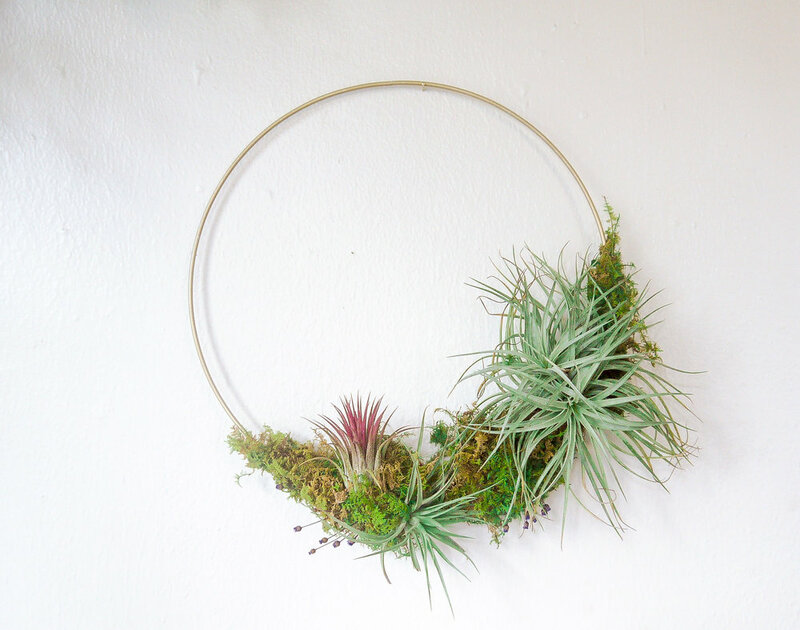 This minimal wreath style incorporates preserved moss, dried flowers and live Tillandsias (air plants). We'll teach you how to construct your own wreath, while also encouraging you to draw from your own creativity to create something magical. You'll leave with the knowledge of how to build these minimal wreaths, and how to properly care for your Tillandsias, so that they continue to thrive on throughout the year. We'll bring the supplies, plants, tips & tricks - you bring your creativity and enthusiasm for working with plants! $60 workshop admission fee includes hands-on assembly instruction, care directions, all plants, materials and use of tools. Shortly after purchase, you'll receive a reservation confirmation email, which serves as your admission ticket. Pre-registration is required. To sign up, simply purchase a ticket here! Come lounge, sip and shop the products of local creatives at this historic Mid-City warehouse! We will be selling staghorn ferns, kokedama, moss walls, tillandsia wreaths and much more! Opening Spring 2018 🌿 Pamplemousse is a historic warehouse & lawn for a variety of occasions; from large receptions to quiet retreats. Join as at one of our favorite chill-spots in New Orleans, The Space. We will be selling staghorn ferns, succulents, kokedama, cacti, houseplants & much more! Join us on the banks of Bayou St. John for an evening amongst local artists!